You are viewing the documentation for an older version of this software. To find the documentation for the current version, visit the Couchbase documentation home page. This guide provides information for developers who want to use the Couchbase .NET SDK to build applications that use Couchbase Server. Downloading and installing the Couchbase client library. 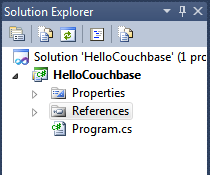 Setting up a command-line driven C# application in Visual Studio 2010, and referencing the Couchbase client library. Writing a simple program to demonstrate connecting to Couchbase and saving some data in the database. Exploring the Couchbase client library’s API so that you are better equipped to begin to write more complex applications. Couchbase REST API, for creating and managing Couchbase resources. After you have your Couchbase Server set up and you have installed the Couchbase SDK, you can compile and run the following basic program. 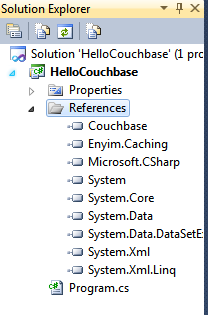 The Couchbase.NET client library is a.NET library that can be downloaded from the Couchbase Client Library language center http://memcached.enyim.com. It is shared with a lower-level library implements the memcached protocol (which is also the low-level protocol supported by Couchbase), along with more functionality through the enhancements that Couchbase provides. Since the project is not a web application, we need to reconfigure it so that a few of the System.Web assemblies are referenced. To do this, we also need to switch to the full.NET 4.0 profile instead of the client profile. Start by right clicking the HelloCouchbase project and choosing Properties and in the ‘Target Framework’ drop-down list, choose ‘.NET Framework 4’. Next, add another reference from the.NET tab of the Add Reference dialog, choose “System.Web (Version 4.0.0.0)”. After you have done these steps, your solution should look like that shown in Figure 2. Next you will need to configure the client library to talk with Couchbase. This is most easily done by editing the App.config file to add a configuration section. You can also do your configuration in code, but the benefits of adding this to the.config file is that you can change it later without having to recompile. Also, when you start writing web applications using ASP.NET you can add the same configuration to the Web.config file. You would change the uri to point at your server by replacing 10.0.0.33 with the IP address or hostname of your Couchbase server machine. Be sure you set your bucket name and password. You can also set the connection to use the default bucket, by setting the bucket attribute to “default” and leaving the bucketPassword attribute empty. In this case we have configured the server with a bucket named “private” and with a password called “private”. Feel free to change these to whatever you have configured on your server. The code creates an instance of a CouchbaseClient in a using block so that it will be properly disposed of before the program exits. Creation of the CouchbaseClient instance is an expensive operation, and you would not want to create an instance every time you need one. Usually this would be done once in an application, and stored for when it is needed. Next the code makes a call to the generic client.Get>T> method. If you know that you’ve stored a string in a particular database key this method allows you to return the string without having to perform a typecast. If you get the type wrong, a ClassCastException will be thrown, so be careful. Any type marked with the [Serializable] attribute can be stored into Couchbase. Press Ctrl-F5 again. You’ll notice that there is no spoon. Where did it go? If you notice, the client.Store() method was given a TimeSpan parameter indicating the expiry time of the key in the database. After that amount of time the key will cease to exist and its value will be forgotten. This is convenient to store information that has a short lifetime, such as a user session, or other data that is expensive to calculate, but is only valid for a short period of time like the daily bus schedule for a given bus stop, or the number of people that have visited a particular web page since midnight. Now you will be able to press Ctrl-F5 every 30 seconds for the rest of your life if you wanted to. The expiry time of the Spoon value will be extended every time the application is run, keeping it nice and fresh. If you stop for more than one minute Spoon will expire again. The Couchbase client library has many API methods that you can use to implement whatever you desire. The following tables outline some API categories, the methods that are available, and a short description of what those methods do. These methods allow all of the operations defined for the memcached protocol, which is implemented in the Enyim client library inside the Enyim.Caching.MemcachedClient class. A few of these methods have generic versions that allow automatic type casting of serializable objects to be retrieved. Many of these methods can also return a Boolean value indicating whether the operation succeeded or failed. Append some bytes to the end of a key. Decrement Decrement a key and return the value. FlushAll Flush all data on all servers for the connected bucket. Get Get the value for a key. Increment Increment the value of a key. Prepend Prepend some bytes to the start of a key. Remove Removes a key from the database. Stats Return statistics about a key, or about the servers in the cluster. Store Stores a value for a key. TryGet Tries to get a value, and returns a Boolean if the value was successfully retrieved. The MemcachedClient has a number of methods that allow a Check and Set operation to be performed on keys in the database. Check and Set operations (CAS) are a way to prevent data loss in a distributed database without heavy locks or transactions. Before you write data into the database you can obtain the current cas value, which is effectively like a version number for the data in the database. When you write your new data into the database you pass along the version you think the data is supposed to have. If, by the time the write happens, the value is no longer valid your code will be told that your write failed. You will then be able to take corrective action such as reading the new value, its cas, and retrying your operation. Perform a Check And Set operation. Decrement Some of the Decrement overloads support returning a CasResult. GetWithCas Perform a Get and also return a CasResult. Increment Some Increment overloads support passing back a Cas to check for whether the operation succeeded. TryGetWithCas Returns a Boolean so your code knows if the value exists or not, and returns a CasResult if it succeeds. The Couchbase library includes the CouchbaseClient class, which is a subclass of the MemcachedClient class. It has a set of methods that provide very powerful ways to interact with data and extent the expiry time concurrently. You will be able to use all of these methods (get, touch and CAS equivalents) on both both Couchbase and Memcached buckets in Couchbase 1.7, except for the Sync operation. Sync is only supported on Couchbase buckets. A special form of Get, sometimes referred to as Get and Touch, which a returns the value but allows the expiry time to be reset. GetWithCas Get a value, its Cas, and also reset the expiry, all at once. Sync A very new operation that allows you to wait for data in the database to change in specific ways. Allows you to know when data has been persisted, replicated, or mutated. Remember this operation can only be performed on Couchbase buckets. Touch Reset a keys expiry date without getting its value. TryGet Try to get a value, a Boolean indicates success, reset the expiry, all at once. TryGetWithCas Swiss army knife. Gets a Boolean indicating if the operation succeeded, gets a CasResult and also resets the expiry time of value. We hope you have enjoyed this very brief introduction to using the Enyim client library to connect your C# programs to your Couchbase database. We would encourage you to spend some time working though the Tutorial application as well. Description Create a connection to Couchbase Server with given parameters, such as node URL. The connection obtains the cluster configuration from the first host to which it has connected. Further communication operates directly with each node in the cluster as required. string url URL for Couchbase Server Instance, or node. string username Username for Couchbase bucket. string password Password for Couchbase bucket. Connections that you create with the.Net SDK are also thread-safe objects; for persisted connections, you can use a connection pool which contains multiple connection objects. You should create only a single static instance of a Couchbase client per bucket, in accordance with.Net framework. The persistent client will maintain connection pools per server node. For more information, see MSDN: AppDomain Class. The Couchbase.NET Client Library store operations set information within the Couchbase database. These are distinct from the update operations in that the key does not have to exist within the Couchbase database before being stored. The Store() methods adds a value to the database with the specified key, but will fail if the key already exists in the database and the StoreMode is set to Add. Description Store a value using the specified key, whether the key already exists or not. Will overwrite a value if the given key/value already exists. The Store() method is used to persist new values by key. Any class decorated with the Serializable attribute may be stored. StoreMode.Set will behave like StoreMode.Add when the key doesn’t exist and StoreMode.Replace when it does. The retrieve operations get information from the Couchbase database. A summary of the available API calls is listed below. The Get() methods allow for direct access to a given key/value pair. The generic form of the Get method allows for retrieval without the need to cast. If the stored type cannot be serialized to the generic type provided, an InvalidCastException will be thrown. List keyarray Array of keys used to reference one or more values. Calling Get() with multiple keys returns a dictionary with the associated values. object expiry Expiry time for key. Values larger than 30*24*60*60 seconds (30 days) are interpreted as absolute times (from the epoch). Calling the Get() method with a key and a new expiration value will cause get and touch operations to be performed. The update methods support different methods of updating and changing existing information within Couchbase. A list of the available methods is listed below. The Append() methods allow you to add information to an existing key/value pair in the database. You can use this to add information to a string or other data after the existing data. The Append() methods append raw serialized data on to the end of the existing data in the key. If you have previously stored a serialized object into Couchbase and then use Append, the content of the serialized object will not be extended. For example, adding an List of integers into the database, and then using Append() to add another integer will result in the key referring to a serialized version of the list, immediately followed by a serialized version of the integer. It will not contain an updated list with the new integer appended to it. De-serialization of objects that have had data appended may result in data corruption. The Append() method appends information to the end of an existing key/value pair. The sample below demonstrates how to create a csv string by appending new values. You can check if the Append operation succeeded by using the checking the return value. Append() may also be used with a CAS value. With this overload, the return value is a CasResult, where success is determined by examining the CasResult’s Result property. The Decrement() methods reduce the value of a given key if the corresponding value can be parsed to an integer value. These operations are provided at a protocol level to eliminate the need to get, update, and reset a simple integer value in the database. All the.NET Client Library methods support the use of an explicit offset value that will be used to reduce the stored value in the database. Description Decrement the value of an existing numeric key. The Couchbase Server stores numbers as unsigned values. Therefore the lowest you can decrement is to zero. Decrement the inventory counter by 1, defaulting to 100 if the key doesn’t exist. Decrement the inventory counter by 1, defaulting to 100 if the key doesn’t exist and set an expiry of 60 seconds. Decrement the inventory counter by 1, defaulting to 100 if the key doesn’t exist and set an expiry of 5 minutes. The Remove() method deletes an item in the database with the specified key. The Increment() methods increase the value of a given key if the corresponding value can be parsed to an integer value. These operations are provided at a protocol level to eliminate the need to get, update, and reset a simple integer value in the database. All the.NET Client Library methods support the use of an explicit offset value that will be used to reduce the stored value in the database. Description Increment the value of an existing numeric key. Couchbase Server stores numbers as unsigned numbers, therefore if you try to increment an existing negative number, it will cause an integer overflow and return a non-logical numeric result. If a key does not exist, this method will initialize it with the zero or a specified value. Increment the inventory counter by 1, defaulting to 100 if the key doesn’t exist. Increment the inventory counter by 1, defaulting to 100 if the key doesn’t exist and set an expiry of 60 seconds. Increment the inventory counter by 1, defaulting to 100 if the key doesn’t exist and set an expiry of 5 minutes. The Prepend() methods allow you to add information to an existing key/value pair in the database. You can use this to add information to a string or other data before the existing data. The Prepend() methods prepend raw serialized data on to the end of the existing data in the key. If you have previously stored a serialized object into Couchbase and then use Prepend, the content of the serialized object will not be extended. For example, adding an List of integers into the database, and then using Prepend() to add another integer will result in the key referring to a serialized version of the list, immediately preceded by a serialized version of the integer. It will not contain an updated list with the new integer prepended to it. De-serialization of objects that have had data prepended may result in data corruption. The Prepend() method prepends information to the end of an existing key/value pair. The sample below demonstrates how to create a csv string by prepending new values. You can check if the Prepend operation succeeded by using the checking the return value. Prepend() may also be used with a CAS value. With this overload, the return value is a CasResult, where success is determined by examining the CasResult’s Result property. The Touch() methods allow you to update the expiration time on a given key. This can be useful for situations where you want to prevent an item from expiring without resetting the associated value. For example, for a session database you might want to keep the session alive in the database each time the user accesses a web page without explicitly updating the session value, keeping the user’s session active and available. The following sections provide release notes for individual release versions of Couchbase Client Library.NET. To browse or submit new issaues, see Couchbase Client Library.NET Issues Tracker. Also updated in 1.0, classes, namespaces and the assembly have been renamed from Membase to Couchbase to reflect the server product name change. What this means to you is that calling code will need to be updated and recompiled when referencing the new assembly. The app config section and config section handler also references Couchbase, instead of Membase.